Powers : With power described as extreme Strength, Nezno can increase his muscle mass almost exponentially to increase his strength to limitless proportions. The drawback to this is that his body often can’t handle the strain resulting in him having seizures. 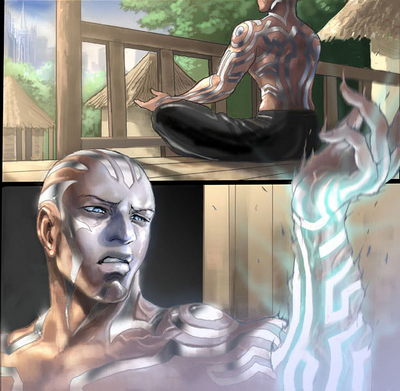 To help him cope with his powers he underwent a vibranium tatooing which had his entire body adorned with the metal to help contain his limitless and dangerous powers. He has lost the sense of touch with the onset of his powers and the more he uses his powers the stronger they become, eventually they will break the tatoos and he will die. A wakandan born mutant to a German father. He was ostracized even before his powers manifested for being a “half breed”. When his powers manifested he was quickly contained by the tattoos and sent to the Xavier School for the gifted. He remained there never using his powers until his team was sucked into hell by the reborn Illyana Rasputin. After this ordeal he fought again during the messiah Complex crossover and later moved to San Francisco to the X-men’s new home base. He remains there still.